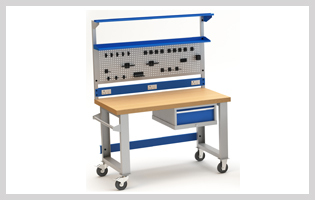 Being major manufacturer and exporter of the various kinds of workstations, we offer industrial work table for the various industrial applications. Our industrial work tables are ideally used as the production line equipment for the packing, sorting, conveying product, conveying raw material, testing of the products and also for the assembly of various products. Model combination of technically superior and dedicated team of engineers and well organized management lead the comfortable range of the industrial work tables. Latest technology with ergonomic assistance resulted in high quality work table for different industries. Industrial work table contains different kinds of table tops as per applications. We provide different options for the table top which is ideally prevent from water, oil, grease and others. It is also provided with overhead tube light to judge perfectly the functions. Our comfortable range of the industrial work table also contain the Perforation panel is provided for better function. It is smartly fabricated to provide excellent working condition with required parts and tools due to proper arrangement of them. They are equipped with monitor stands, adjustable footrests, document holder and adjustable shelves. It is also convenient for the standing and sitting arrangement of the operator. Convenient design of workstation supports the elbows, forearms and wrist of the operator. Perfect height makes convenient operation facilities. It also provides conveniences with exact size of drawers with partitions and dividers to keep the inventories of tools and kits. We can customize industrial work table as per requirement and specification.